Before you even go there, we get it. And to a large extent there's agreement all around, for there's nothing worse than seeing sportswriters penning those open letters to a global icon, unaware of the arrogance of thinking we even exist on a similar plane. There's usually two reasons for doing it though, and both are deeply misguided. The first is self-serving, as if the athlete will take a look, enjoy the pandering, and therefore give up some access and exclusivity down the line. The second is that there's some profound point that needs making and, when they read it, they'll be well served by such wisdom. Both rationales make the same mistake however. Thinking that somehow the target will actually care to start with, then digest it, and then give it some further depth of consideration. But hang on, for sometimes there is a time and place. It's rare, yet on occasion the world crosses a line, leaving so many ready to throw a match onto the wicker man, in what amounts to a tragic act of persecution. That's the case here but be patient as this is a first - an Open Letter To Maria Sharapova. And if she wants to sit down for an interview after this wisdom, that's an open offer, too. I hope these words find you well and I hope they soothe you in your hour of need. Ever since your press conference last Saturday, I've watched the replays over and over and felt the urge to reach out, as it became too much. Once again you've been the victim of a jealous media that are desperate to take you down. For shame. Please know that some of us way below you can still see the truth. As you are aware, two questions stood out and quickly became clips that many thought gave them the right to have a go. The first involved the booing which you correctly said you didn't know how to answer, as to avoid telling a truth people cannot handle was decency of the highest calibre, the sort we've come to expect. What followed was worse as Stuart Fraser of 'The Times' asked if the banning of the drug that aided your sickly health for so long affected your performance given the pressures of a Grand Slam. Who does he think he is, querying about tennis performance at a tennis press conference? Your sigh and "next question" was the reply he deserved. Don't these hacks know what these settings in your presence are supposed to be about? Don't they know how almost all other journalists act around you? Don't they know that it's supposed to be a PR act? It's about time the WTA and ITF sorted this nonsense. Besides, your comeback from that unfortunate mistake was heartbreaking enough without raking over cold coals. Who could forget that day in Stuttgart in April 2017, when the media again went for you upon your comeback. "What was it you missed the most? Can you describe the feelings when you came out? Would you be prepared to try and qualify for the French Open?" "How much of a relief was it to see the strength you have in practice transmit out there? What do you make of Serena Williams' pregnancy?" A bloodbath. It's still upsetting to recall. Some there even asked about the Meldonium. Have these animals no patience? If they'd just waited a couple of months they could have read your article in 'The Players' Tribune', where over the course of 4,000 tear-jerking words you rightly addressed your place as a martyr. Amidst such prose, it was of course easy to forget to mention pretty much anything to do with the doping. I understand that. "I've always tried to keep a generous attitude toward critics in general, whoever they are, and whenever they've been there," you penned in that powerful tome. "I've always wanted to respond by showing grace. I've always wanted to face my critics by simply taking the high road. And by showing them, by showing everyone, that taking the high road is a choice." Have truer words ever been written? Not bloody likely. There's a line you might recall from the film 'Anchorman II'. Ron Burgundy says, "I just don't know why we've to tell the people what they need to hear. Why can't we just tell them what they want to hear?" It was a knock on the state of society, but in trying to save us from ourselves you've stood up to this issue. You refuse to tell people what they want to hear. You won't tell them why before your 15-month ban for Meldonium, that you suddenly put down to a serious health condition, you hadn't once mentioned it before that. You won't tell them how you managed to play to such a high level for so long with such problems. You won't tell them how, when running a €30m-a-year business, not one of your employees noticed the relatively high-profile banning of the drug. You won't tell them why you took a drug recommended for four-to-six weeks for a decade. You won't tell them why as a United States resident you were taking a drug not licensed there. That takes courage. And morals. Therefore, can we all not simply bask in the fact that it's quite a miracle you are not in the grave and purchase merchandise accordingly. You are rich and famous and a celebrity, so society ought to take everything at face value and leave it at that. They buy the brand already so what's so difficult about buying the bulls**t, right? Often it's human nature to project the talents we've been given. It's why funny people tell jokes and why intelligent people demonstrate knowledge. There's a hint of arrogance off that and common folk need to understand that you have railed against what you've been given. There was all that tennis talent you've pushed to the side since returning, as you've generously been very average in more recent times. Then again, so much is to be admired. So don't let them get you down, for a film is surely in waiting and would show them all. On the upset scale, it'll likely register somewhere between 'Schindler's List' and 'Sophie's Choice'. If only everyone knew the hardship you went through. If only they were aware of the poverty you grew up in despite your parents being friends with the Kafelnikovs, whose son was a Grand Slam champion before you were 10. Despite the fact that they cobbled together the cash to send you the 1,622 kilometres from Sochi to Moscow so you could attend a tennis clinic with Martina Navratilova. Despite the fact a year on and you and your dad moved halfway around the globe so you could join the IMG Academy near Tampa. We can but thank a higher power that such strife no longer exists. Overall, what has happened you since your ban smacks more and more of white, male entitlement. Okay, you're white, and the stuff in your system was helping beat women, but we both know this is the reality. You are not alone, as Serena Williams sometimes gets disgracefully critiqued based on her choices too, but she can hardly understand what it was like to grow up a blonde Caucasian in Florida. To have all that stewing in your mind that day you came out and admitted you'd been caught, and had to look at the garishness of the carpet in that LA hotel lobby, it's no wonder you wept. To think some said the tears were choreographed. To think they've baulked at your lack of contrition too, but they weren't the ones spending an afternoon in an establishment that clearly had no more than four stars. If only they'd your strength. Thankfully, there is a group who do understand what you've been through and have stuck by you for the most noble of reasons. 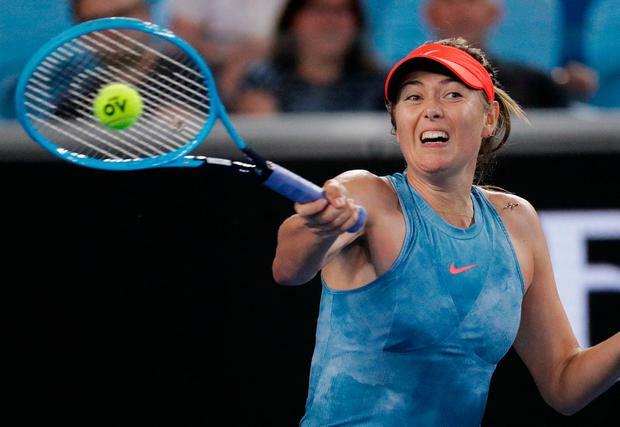 Head of the WTA Steve Simon said upon the positive: "I am very saddened to hear this news about Maria. She is a leader and I have always known her to be a woman of great integrity." He's the sort that puts morality over money, fairness over business. As are the sponsors like Nike, who considered your position and refused to buckle, no matter the screams and screeches of the baying mob. They make the world a better place. As do you. At least now the boorishness of Australia is out of the way, and the class of Wimbledon is creeping around the corner. There you'll be met by the sort of decent Brexit folk that are sure that their country is going to return to the glory days. They know a thing or two about a thing or two. And at some point when on court one of them will roar out, "We love you Maria". They'll be right. We do love you Maria.